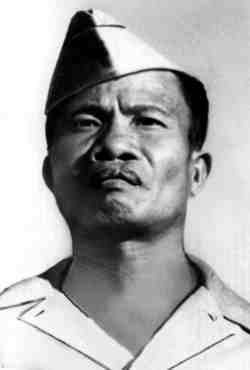 was the first Filipino Soldier to have received the Medal of Honor during WW II. Jose was born on December 29, 1907 in Barangay Tagsing, Leon, Iloilo Philippines. He had three siblings of which he was the oldest. His mother died when he was 12 so he had the extra responsibility of helping his father raise his siblings. Barangay Tagsing is an agricultural community and is populated primarily by farmers. It was also one of the primary areas for the resistance movement during the Japanese occupation. Having heard from some of his friends and relatives in the town of Leon who had joined the Philippine Scouts that it was a top notch unit, Jose enlisted on March 12, 1930. After his basic training he was assigned to company “C” 24th Artillery at Fort Stotsenburg, Pampanga. From the time he joined until 1940, the Philippine Scouts trained vigorously. They were excellent marksmen and each spring teams of their most outstanding experts were sent by each regiment to Camp Perry, New York, where they competed effectively against the best in the US Army. Increasing Japanese successes in China in late 1930’s followed by their movement in Indo-China in the summer of 1940, finally energized the US War Department. General George Grunert asked the war Department for re-enforcement of troops and supplies. For the Philippine Scouts, doubling their strength to 12,000 men took effect in 1941. The 88th Field Artillery Battalion, Jose’s unit, was constituted into the Regular Army on 1 October 1933 and was activated on the 19th of April 1941 in the Philippines. The Scouts were awakened on the morning of 8 December 1941, to learn that they were now in the war for which they had been trained. The First Battalion, 88th Field Artillery Philippine initially was deployed from Fort Stotsenberg in December 1941 in the barrios of Mexico and Lagaban, Bataan. On December 30, 1941, the Battalion moved to Hermosa. In early January, the Battalion joined the 23rd Field Artillery Battalion Philippine Scouts in support of the 31st Infantry (US) in defending position at Layac Junction. The 1st Battalion, 88th Field Artillery Philippine Scouts was in more protected position than the 23rd and, therefore, did not suffer as heavily as did the 23rd. Major Howard, one of the commanding officers from the 1st Battalion 88th Field Artillery Philippine Scouts. reported in his notes that they had 1st battalion, lost one gun during the withdrawal from Layac Junction line. On the 6th of January, the 1st Battalion Field Artillery was supporting the defensive line behind the Culo River held by the 26th Cavalry Philippine Scouts, the 31st Infantry (US) and the Philippine Army units. When one gun was put out of commission by the enemy fire, Sgt. Jose Calugas of the 88th Field Artillery voluntarily ran 1,000 yards across a shell swept area, put the gun back into action and fired effectively against the enemy although his position was under constant heavy enemy fire. Sgt. Calugas manned the 75-mm cannon by himself and fired effectively, destroying about sixty advancing vehicles and their occupants. For his action beyond and above the call of duty, he was awarded the Medal of Honor. Rank and organization: Sergeant, U.S. Army, Battery B, 88th Field Artillery, Philippine Scouts. Place and date: At Culis, Bataan Province, Philippine Islands, 16 January 1942. Entered service at: Fort Stotsenburg, Philippine Islands. Born: 29 December 1907, Barrio Tagsing, Leon, Iloilo, Philippine Islands. G.O. No. : 10, 24 February 1942.